The U.S. Air Force Thunderbirds are seen rehearsing their precision flying routine, September 18, 2015 in Forestville, Maryland. The U.S. Air Force Thunderbirds have canceled an air show appearance in Rhode Island this weekend. 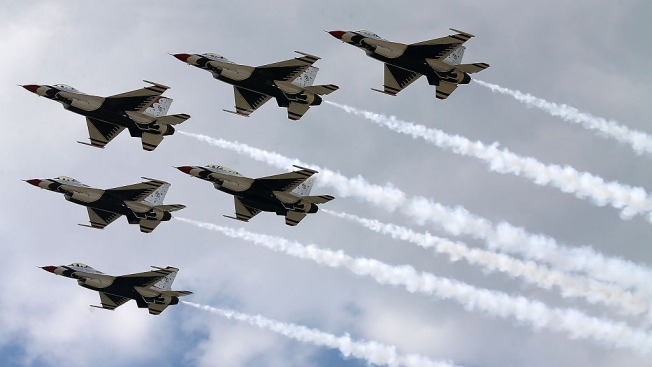 The Thunderbirds announced Tuesday on Twitter that they canceled their appearance at the Rhode Island National Guard Open House Air Show scheduled for Saturday and Sunday. The air show announced on Facebook that it looks forward to welcoming them back in the near future. A Thunderbirds pilot was forced to ditch his plane last weekend shortly after a flyover at the Air Force Academy's commencement ceremony, where President Barack Obama was speaking. Officials said at the time they would cancel upcoming shows while they investigate, but they didn't say how for long. The Thunderbirds said on Twitter that their participation in an air show in Maryland June 18 to 19 is not yet determined.